"Doctor Who" fans, or “Whovians,” are unique among television show fandoms in that each fan can point to a favorite version of the Doctor without also having overwhelming disdain for any particular actor in the role. A popular T-shirt cheekily states, “You never forget your first Doctor,” and it’s spot-on; a Whovian’s fan identity is typically established with the first incarnation of the Time Lord (or his companion) they fall in love with. By comparison, Trekkers can debate about who their favorite captains from the many iterations of "Star Trek" were, but there generally isn’t much disagreement over which specific version of Kirk they love the most (sorry, Chris Pine). Newer "Who" fans might have joined the party with the debonaire tenth Doctor, David Tennant, but many thirty-somethings within the fandom have a particular fondness for Tom Baker. Baker, with his iconic scarf of many colors and sandy blond afro, was the fourth Doctor and the first whose tenure received an extended run in the U.S. on PBS in the late 1970s (although selected episodes of third Doctor, Jon Pertwee, did air stateside prior to that). For decades, “Doctor Who” targeted families and garnered solid ratings in the United Kingdom before it was suspended in 1989 due to dropping viewership. Russell T. Davies revived the series with the ninth Doctor, played with edgy fury by Christopher Eccleston, in 2005 following a 16-year absence (save for a 1996 TV movie). Tennant’s Shakespearean flare helped establish a quirkier vibe and romantic core for the show, while Smith’s bow-tie-clad turn has transformed the show into an American pop culture staple. The current season’s September 1 premiere earned 1.6 million viewers, a series best since the show moved from Syfy to BBC America in 2009. The numbers represent a 23 percent increase in viewership from the show’s 2011 premiere, and the sixth season was the most downloaded show on iTunes in the US last year. The Doctor’s companions, too, are expected to be swapped out with some frequency. Following the Ponds/Williams’ TARDIS retirement, the Doctor flew off with their daughter - also his wife - River Song. The comfort of seeing a familiar face helped lessen the blow for fans: River Song has crossed paths with the Time Lord many times over the last five seasons of "Doctor Who." Certainly, Karen Gillan, the actress who played Amelia (Amy) Pond, wasn’t entirely ready for the end of this companionship. After learning her character’s fate in this weekend’s episode, “The Angels take Manhattan,” she sank into sadness. “I was crying for pretty much the entire two weeks we were shooting that episode. In between takes. Just, in life. Little things were setting me off. I was sensitive,” she said at San Diego Comic Con during the Doctor Who panel in July. 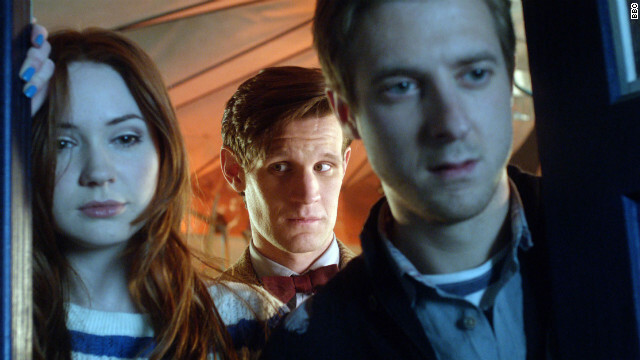 In a pre-panel interview, fellow companion Arthur Darvill (who played Rory Williams, Amy Pond’s husband) said he has enjoyed being one-half of the first married couple on the TARDIS as well as the longest-running modern companions. “We're so close to it at the moment and I think it will take a few years to be able to actually realize what we've done personally, but also kind of how it is on the show," Darvill said. "Hopefully we've added something quite exciting to it." Fans have known since March of this year that Amy and Rory would leave the Doctor's side and newcomer Jenna-Louise Coleman will end up riding shotgun in the TARDIS. Fans may remember her as the crashed spaceship survivor from the first episode of this season. “If you look at the history of the man, he picks up hot chicks and travels around the universe for two years and then goes, ‘eh, see you later, Rose,” joked Smith. The character of Rose Tyler established the possibility of a companion who was also a love interest - she captured the heart of the tenth Doctor, who still somehow managed to end up with two more companions before his regeneration. “I think that everyone, including the U.S. fans, also seem to really get and love the fact that 'Doctor Who' is kind of all about change and change is its essence, and it must never stop moving because that way the show won’t really be at its full strength,” Skinner said. And yet, there is a big change in the near future that poses a challenge beyond finding a new companion or actor for the Doctor to regenerate into. According to show lore, a Time Lord can only regenerate 13 times, and Smith is currently the eleventh incarnation. I like to know more about Number 8 (Paul McGann) as the Doctor in his adventures and how he re-generated into Number 9 (C. Eccelson). Note: Matt Smith is now Number 11 and according to WHOVIAN lore, there's only two more regenerations before the end. while i love most of the reincarnations of the Doctor, there are some companions who bug the stuffing out of me. Martha first and foremost, but I can't say I'm not looking forward to when River Song finally goes to the library. She gets less and less likable to me with every episode she's in. Donna was my favorite. While the show gets a lot of kudos from me for attempting to borcah the subjects of depression and suicide, I thought it veered too far in the direction of making his condition look almost like a superpower. And the scene in the museum made me cringe; I found myself thinking, Nine would never have done this. The musical choice for that scene was way too over-the-top for what should've been a respite from the storm for Vincent.But I will say, when the BBC put up the number encouraging people to get help, it made me smile. they could have left Centurian Rory and Amy for another season. She's hot and he waited for years for her. Still waiting on the next episodes instead of just the couple or so the bbc throws out, and just stops. I don't know where all this Whovian/Trekker stuff comes from. I have always proudly been a Whoite and a Trekkie, tyvm. I really do not know why people are thinking that this is the 11th incarnation of the doctor. Back in David Tennet's Missing Earth, the two parter with the Daleks, he is shot and starts the regeneration process. He even said that he stopped his body from completely changing and put all the regeneration energy into his spare hand, his "lucky spare hand". At this point in time he would then be the 11 incarnation of the Doctor. So when Matt Smith took over he would have been the 12th, but in the episode Let's Kill HItler, River uses all her remaining regenerations (which would have been around 9 of them) to save his life. With that, regenerations are transferable between Timelords, if you go back to the movie in 1996. So would this then mean that our Doctor has 10 more regenerations or just one? The companions are supposed to change frequently. I was quite tired of Rory and Amy as the companions. I liked the actors but it is time for a new companion! She could have lasted longer without Rory. Marriage sucked all the fun out of the relationship. You mentioned the fourth Doctor, played by Tom Baker, had a scarf and blond afro. His hair was waivey and brown. The sixth doctor, played by Colin Baker (apparently no relation), had the blond afro as well as the brightly colored jacket. River showed up in the season 4 in Silence in the Library episode with Donna. It's now season 7. How did CNN get past 5 seasons?? As for regenerations, I thought they changed the continuity after they exiled the Time Lords out of this dimension allowing him unlimited regenerations. Also, River, having been conceived in the TARDIS, had her own regenerative capabilities which she "gave" to The Doctor in order to save his life (after she tried to kill him). As she had only appeared to have 4 generations, this means that while she is now mortal, her other 8 lives should have transferred to The Doctor. This is as opposed to The Master who actually hijacked someone else' body to gain further regenerations (4th Doctor era). However, as The Master was resurrected by the Time Lords between Doctors 8 and 9 to help in the Dalek war, the Master technically had 10 regenerations left but he allowed himself to die in order to get perfect revenge against the Doctor by forcing him to be the last Time Lord.